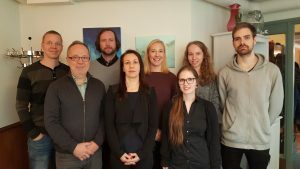 The Attention and Memory Networks research group aims at clarifying the functional networks of brain areas involved in auditory and visual change detection, memory, involuntary switching of attention, voluntary auditory and visual selective attention and multitasking. We use behavioural methods, functional magnetic resonance imaging (fMRI), electroencephalogram (EEG), magnetoencephalogram (MEG), and eye movement recording. AMN 2017 Christmas Seminar at Restaurant Messenius. 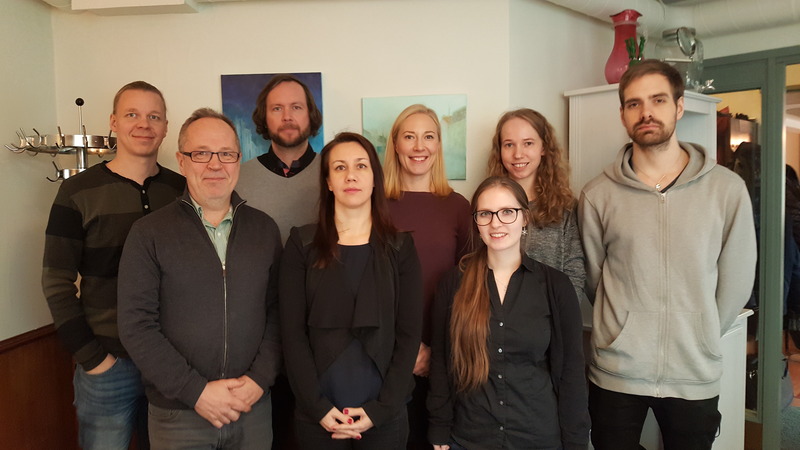 From left to right: Viljami Salmela (AMN collaborator), Kimmo Alho, Juha Salmi, Alina Leminen, Mona Moisala and undergraduate students Maxime Vewoert, Anniina Åkerla & Artturi Ylinen. Click to view a full size picture.